JioFiber to face the DTH players. 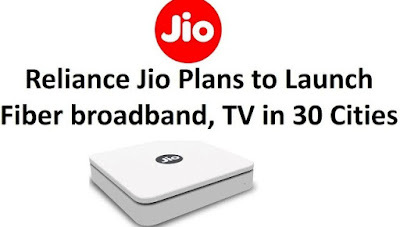 December 2018 is the objective that Reliance Jio has proposed to launch its broadband services. According to a report in Digit, JioFiber will initially be launched in 20 cities with a minimum speed of 40 Mbps. An Optical Network Termination Box (ONT) will be installed in the homes of users who can even handle IPTV requests. This means that Jio's goal is not only broadband companies, but also DTH providers, including Tata Sky, Dish TV, Airtel DTH, etc., as it prepares to offer all-in-one integrated services. The ONT box can be connected to a TV or any device. There are four LAN ports connected to the device. Subscribers who opt for special plans can take advantage of speeds of one Gbps. The price of the service is not yet known, but people are expected to get unlimited packages like their current mobile phone schemes. Initially, it will go to level I and II cities, including Mumbai, Delhi, Kochi, Bhopal, Chandigarh, etc. before he moves to other cities. In its frequently asked questions, the company boasts of the superiority of JioFibre in stating that connectivity will be until each house secures high-speed Internet, while others will only provide fiber to the building, after which a traditional cable will be used to reach all the houses, thus reducing speed and causing frequent disturbances. He goes on to say that the fiber network does not need to be changed after the first installation since the company will ensure the upgrade with the latest technology that will create electronic pulses of light.